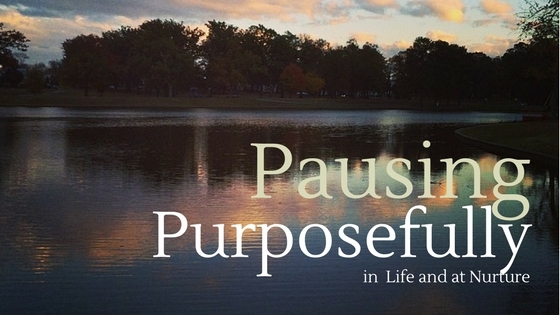 Pausing Purposefully in Life and at Nurture - nurture. Last year I (Leslie Lytle) was thrilled to be able to deepen my understanding of circle process, racial and social justice, and perinatal support programming for marginalized citizens through the Pat Asch Fellowship for Social Justice. Each training I attended felt nourishing, profound, but also overwhelming, as it became obvious that I have so much more to learn and so much farther to travel on this path. Returning home, inspiring moments were often covered over by the rush of to-do’s, multiple priorities, and the enormous mountain of work before me. In April the Fellowship enabled me to attend a Cultivating Leadership Through Mindfulness Retreat, held in the beautiful Catskill Mountains just as they were beginning to blossom into full spring. And suddenly the task before me wasn’t about learning new skills or paradigms, it was about becoming reacquainted with myself, my own strengths and frailties, my dreams and aspirations, about learning to create more space in the often hectic busy-ness of working in the nonprofit field. Turning down the volume of interruptions, practicing listening, and purposefully pausing is helping me navigate the complex territory of my personal and professional life with greater clarity and equanimity. Nurture is also taking a purposeful pause* this summer, to reconnect with who and where we are as an organization. In the past year and a half, we’ve stretched ourselves mightily – collaborating with community partners to produce training programs for perinatal service providers, providing technical assistance and instructors for the Mindful Moms research study, producing two Birth & Baby Fairs, participating in the VCU Broad Street Mile, beginning a series of Community Conversations for Maternal Health, exploring the foundation for a Community Directory for Pregnant and Postpartum Families, and continuing to offer the city’s only donation-based prenatal and postpartum yoga classes. During this time we’ve tripled both our income and our workload, without an accompanying increase in staff (virtually all of our work is accomplished through volunteer effort). Though we have much to celebrate, we’re spread mighty thin. The landscape in which Nurture operates is also changing. Recognition of the importance of appropriate perinatal support on the long-term health of babies and their parents is increasing, as is the availability of certain kinds of support, such as prenatal yoga, perinatal mental health services, and doula and breastfeeding support. However, these resources remain inaccessible to many in our community. One of the primary reasons Nurture was founded was to create a structure for more equitable access to perinatal health resources across economic and sociocultural lines. However, that vision exists not in isolation but within the context of a country that has become increasingly divided. While we remain steadfast and committed to establishing a perinatal resource center, that goal seems both more unattainable and more urgent as our understanding of how racism, sexism, and poverty intersect in the perinatal health arena deepens, and as funding for women’s health is jeopardized. Given the changing environment, we’re not sure of the relevance of our original goal of establishing a bricks and mortar location. We’re also questioning the processes we’re using to achieve this goal, i.e. our own role in re-creating the inequalities we see within our community. It’s a shaky, often confusing place to be. On the upside, we’re also participating in conversations with other organizations to explore how we can collaboratively create networks and systems to sustain the work each of us is attempting to do within our respective spheres of influence. Through conversations with other nonprofit leaders, Nurture’s Board of Directors has noticed that there is a crisis in our local RVA nonprofits. Our Boards and leadership do not reflect the populations we intend to serve. Often, one is invited to be on a Board because of their time, talent, treasure, and connections. But if the issue is equitable access in board leadership, who has access to time? Usually, it is people who have partners with steady, comfortable incomes, or people who have the luxury of salaried jobs who take time off to volunteer. Who has talent? This is a much larger question. It’s more like, who has access to education that nurtures innate talents. Who has treasure? This question invites its own answers, but often wealth is inherited, which means ancestors were favored by systems that let them advance and earn enough to leave wealth to descendants. Who has connections? Who? When you go to nonprofit conferences or meetings, with whom do you sit? That is how you make key connections, and, yes, we need to ask ourselves how we, ourselves, exclude others whom we perceive to be different from us. It’s easy to be inclusive in theory or to include from the comfort of distance. At Nurture, we are struggling, even stumbling clumsily, over questions such as these. Crisis invites all of us to participate, yet, from our inception, we have earnestly attempted to be inclusive. While we are only four years old, like a pre-kindergartener, we have had steady minority representation on our Board and committees, including a prominent female African-American nonprofit leader, a well-respected and well-loved male Oriental medicine specialist who is LGBTQ, a female Asian-American who comes from a multicultural family and works in development, and a female Muslim with superior editing and proofreading expertise. We by no means rest on our laurels, and seek more leaders from the populations that need us the most. And we acknowledge the necessity of addressing the profound lack of support for pregnant and postpartum families from minority backgrounds, even as the needs of all pregnant and postpartum people are under-recognized and under-supported within our community. Big questions. And these are just some of the questions we’re grappling with as an organization. Right now our future seems a bit foggy, and we’re taking steps only as far as we can see. But we’re doing this together, learning to be OK with being uncomfortable, with the uncertainty of not having all the answers. We are hopeful that by taking this “purposeful pause,” by creating space for conscious reflection, we will uncover the through-line that leads to clarity of action in these tumultuous times. We invite you to be part of this process by leaving your thoughts and questions in the comments below. Looking forward to more dialogue! *Though we are taking a strategic pause, our regular prenatal and postpartum yoga classes continue, as will the Community Conversations. And we are continuing our work on a Community Resource Directory and exploring professional development offerings for early 2018. Our relationship with Nurture has been wonderful, engaging, and life changing! We support you during your “purposeful pause”. May it bring peace and blessings to your hearts.